Ringing in the New Year in Times Square and watching the Ball Drop is the most popular activity at this time of year. If you’ve booked a Ball Drop Room at Manhattan at Times Square, you’ll get the best of both worlds: prime view of one of the most famous New Year’s Eve events in the world without the crowds. If, however, you’re after a night-long celebration that doesn’t involve queues, lack of bathrooms and security checkpoints, we’ve listed our top picks of NYE parties, events and experiences at affordable prices. Scroll down to find the right one for you! The first item on this list is completely free. Fireworks color New York City’s skyline on New Year’s Eve. Hop on the Staten Island Ferry before midnight to see the fireworks over the five boroughs. If you’d rather pay extra for a guided tour of New York Harbor, check out the different New Year’s Eve tours offered by cruise lines. Many offer drinks, dinner and live entertainment. Thousands of people flock to Greenwich Village in search of great bars. Our recommendation? Get tickets for Bleecker Street Block Party - you’ll visit some of the best bars along Bleecker St, with the option of open bar at select venues. When dancing and electronic music is your thing, BangOn! NYC is the best option for an affordable and energetic party. 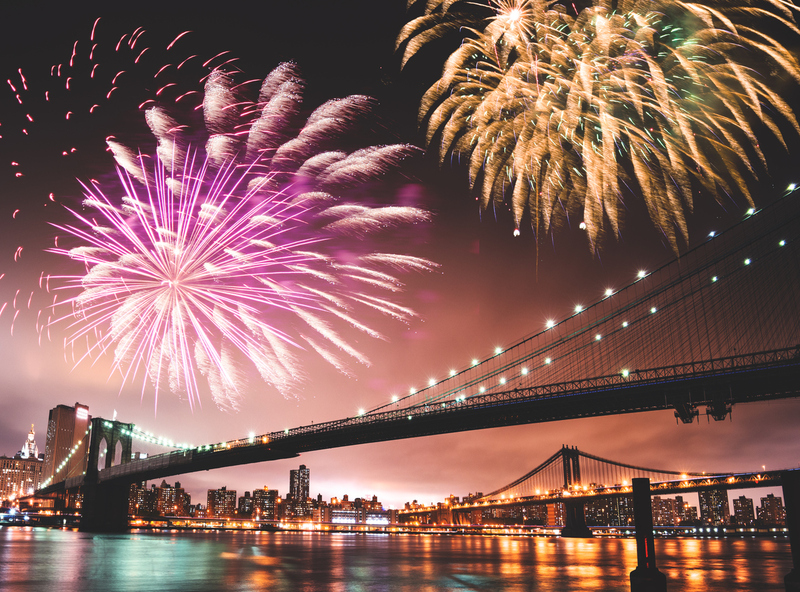 Brooklyn Bridge is perfectly positioned to offer great views of fireworks in Manhattan and Brooklyn over its 1.1 miles. The Brooklyn Bridge Pedestrian Walkway is easily walkable and New Year’s Eve is a good time to see it at night. Head to Coney Island for quirky and fun events: comedy shows, fire performances, circus sideshows, and much more out-of-the-ordinary experiences. As one of the top venues in NYC for performances, Lincoln Center hosts world-class events on New Year’s Eve. Consult their calendar for full listings and ticket information. The highlight of the day is the annual New York Philharmonic New Year’s Eve concert. Since 1984, the Cathedral Church Of Saint John The Divine has been delighting audiences with its annual concert of beautiful classical music and choir. If getting fit is among your New Year’s resolutions, start the year right by participating in a fun 4-mile run around Central Park’s most visited sites, starting at the stroke of midnight. Warm up dancing to music of the Pre-Race festival starting at 10pm. Bikers will be meeting up at Plaza Hotel (59th St and 5th Ave) at 9:30pm to head downtown to a dance party at the Museum of Reclaimed Urban Space for a night featuring local artists and musicians.